RC Willey has this beautiful natural brown 2 piece classic entertainment center for your home. With its large design, you can house the largest TV and create a stunning entertainment area that is sure to impress. With the combination of open shelves and shelves behind beautiful glass doors, you will find that you have ample space to organize all your media and gaming devices. Finally, the beautiful hardware adds the perfect finishing touch to this furniture. Call your friends and plan a movie night, you will want to show off your beautiful new entertainment area once this piece shows up in your home! 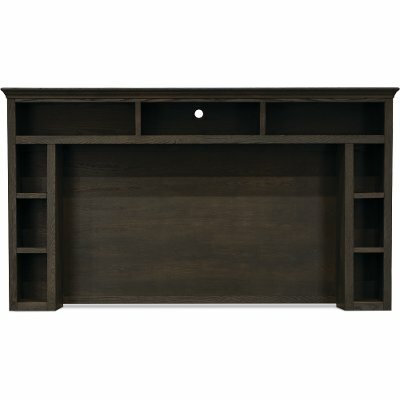 RC Willey has this natural brown rustic oak 97 inch TV stand. With its large design, you can house even the largest TVs on this stand. You will love all the storage space and media device organization on its numerous shelves. You have open shelves and shelves behind beautiful glass doors which give you ample space for all your media and gaming devices. Finally, the beautiful hardware finishes off this piece perfectly! 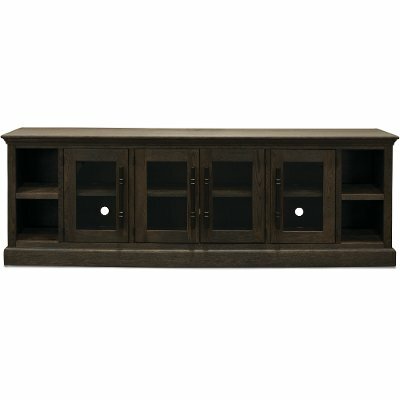 Natural Brown 2 Piece Classic Entertainment Center - Barnhouse is rated 4.5 out of 5 by 2. Rated 4 out of 5 by DesertRats Large Hutch for Entertainment Center This is a very large piece that fits perfectly in our living room. It has multiple shelves to house all our many decorative items. The finish on the piece is a bit more rustic than I would have liked and that is why I only gave it 4 stars; however, it gives an impressive feel in the living room. Rated 5 out of 5 by Dayper Great piece Seems that it's hard to find just what I want anymore....something well made for a reasonable price. The hutch and stand are a perfect size for our family room and accomodate a 65" TV quite nicely. I love that there are plenty of cubbys for decorative items as well as DVDs and VHS tapes. I didn't care for seeing my wall paint through the holes for the wires in the back, so on the ones I didn't use, I taped black construction paper over them on the back side. This piece is heavy, nearly 300 pounds, but a crow bar, 2x4 and moving pads for carpet made it fairly easy to move back and forth as we hooked up the equipment. Fastening it to the wall was a necessary project here in the earthquake zone. 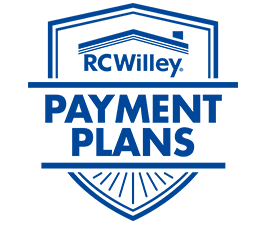 There were a few flaws that the service man at RC Willey adjusted and overall, we're very happy with the purchase. Chris and Funaki delivered it and were very careful.